Novalawcity: Message to Ike: stay away from the Hebert boxes! Message to Ike: stay away from the Hebert boxes! But what's a Hebert box, and why should Ike stay away from it? 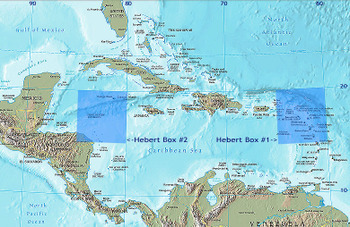 Hebert boxes are two 335x335 mile areas, one on each side of the Caribbean. They get their name from National Hurricane Center forecaster Paul Hebert, who observed that hurricanes that pass through them are more likely to hit South Florida hard. Conversely, many hurricanes that have appeared to be targeting South Florida that go around the Hebert boxes have a tendency to swerve and miss south Florida at the last moment. However, it's not a hard and fast rule: 1995's devastating Hurricane Andrew tracked just outside a corner of the eastern Hebert box. Hebert himself acknowledged that the boxes are not a guarantee of hurricane landfall either way, but cautions that if a hurricane passes through one, "really, really pay attention. We worry plenty in August and September when one goes through that box, and we have a certain comfort level when one misses the box. It looks like we could get lucky with Ike, whose predicted path seems safely above 20 degrees north latitude for the moment, but it's still not a bad idea to fill up your gas tank and make sure your hurricane kit is fully stocked this weekend. There's still another three months of hurricane season, and Tropical Storm Josephine is on the map!